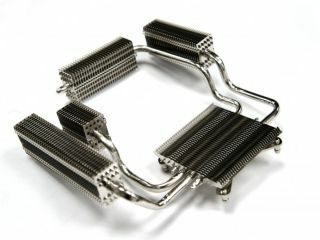 Thermalright, known for its CPU heatsinks, has come out with the Thermalright TR360, a cooler built for the Xbox 360. The improved cooling and heat dissipation that it offers will, the company says, "prolong usage of the GPU and reduce the chances of the unit breaking down". The TR360 features a nickel-plated heatsink and a design with four dedicated 6mm heatpipes. The base is made of pure copper and plated with nickel. Because this needs to be fitted into the console, Thermalright has warned customers that the work should only be done by someone who knows how to disassemble the unit. The risks are completely your own. So, if you add it your console, your warranty will disintegrate in front of your eyes. But your Xbox will be oh-so cool. For more details, go to Thermalight's website.